Home > Apologetics Topics > Bible Contradictions > Did God Tempt David to Sin? Who Tempted David to Sin? I came across your website through some apologetics links and it is the only few websites where you can actually submit your own question about the bible. 2 Samuel 24:1 -- Again the anger of the LORD burned against Israel, and he incited David against them, saying, "Go and take a census of Israel and Judah." And in 1 chronicles 21:1 -- Satan rose up against Israel and incited David to take a census of Israel. Now which is correct? Is this a contradiction? Please explain. Hope to hear from you soon. Your question is a good one. This is a classic example of how skeptics will try to show the Bible as being contradictory. However, careful study of language and idioms can bring about satisfactory solutions to these types of passages. Before we begin, I'd like to review a basic principle of logic called the Law of Non-Contradiction. It states "Any 'thing' (A) cannot be non-A at the same time and in the same way." In other words, something that is brown cannot be not brown. This seems simple enough, but many people forget the second half of the law, and over-simplify their reasoning. For example, a dog can be described as brown. In his later years, though, he could turn grey. So the statement "My brown dog is grey" is not a contradictory one. You see the "at the same time" phrase is important. Further, suppose when the dog was young he became jealous of another animal. Then, the phrase "My brown dog is green with envy" is not contradictory because the statement doesn't use color in the same way. Now, let's examine the passages in question. 1 Chronicles 21:1 states that, "Then Satan stood up against Israel and moved David to number Israel." Notice the idea behind this passage is the temptation of David. Satan was actively involved in David being moved to have a census. Further in the chapter, David admits this is a sin when he declares "I have sinned greatly, in that I have done this thing.(vs. 8)" So the context of the passage plainly demonstrates that the census was an act against God. In 2 Samuel 24:1, though, we read this, "Now again the anger of the Lord burned against Israel and it incited David against them to say, 'Go number Israel and Judah.' " Notice the emphasis in this sentence is the anger of God. Though linguistically the sentences are very similar, we must understand the context and what the writers' intents were as they penned these accounts. There would be no contradiction if BOTH statements are true ones. We know that God will not tempt anyone(James 1:13). In fact He can keep us from temptation. We are taught to pray for such in Matthew 6:13. In fact, 1 Cor. 10:13 says, "No temptation has overtaken you but such as is common to man; and God is faithful, who will not allow you to be tempted beyond what you are able, but with the temptation will provide the way of escape also, that you may be able to endure it." The statement that God doesn't allow some types of temptations (those which you aren't able to resist) shows that He is in control of what chances for sin you may have. In other words, God will place a barrier between Satan and the believer and only allow him certain access. Also implied in this is the idea that Satan and his minions do seek to make the believer fall. So, taking what we know to be true about the nature of God, we draw the conclusion that God wouldn't have tempted David to sin. However, the statement is not a contradiction. Remember, we agreed that in order for a contradiction to occur the words must mean the same thing in the same way. The Jewish line of reasoning always saw God as the ultimate cause of all actions, either positive or negative, because of his overseeing power. This is the reason God speaks of "creating evil" in Isaiah 45. It's much like the president of a corporation claiming that he sold 45 million units last year. He didn't do it physically, but his programs and ideas allowed it to happen. There is another instance in the Book of Job that is very similar to this. The book opens with all of the angels presenting themselves before God's throne. Satan also comes before Him and God points out that Job is more upright and blameless than anyone else on earth. Satan replies, "Does Job fear God for nothing? Hast thou not made a hedge about him and his house and all that he has, on every side?... Put forth thy hand now and touch all that he has; he will surely curse thee to thy face. Then the Lord said to Satan, 'Behold all that he has is in your power, only do not put forth your hand on him.' " Notice that God does not take away anything that Job has, nor does He cause the destruction; but He allows Satan specific license with Job. In our instance, we have God allowing the devil the opportunity to tempt David. 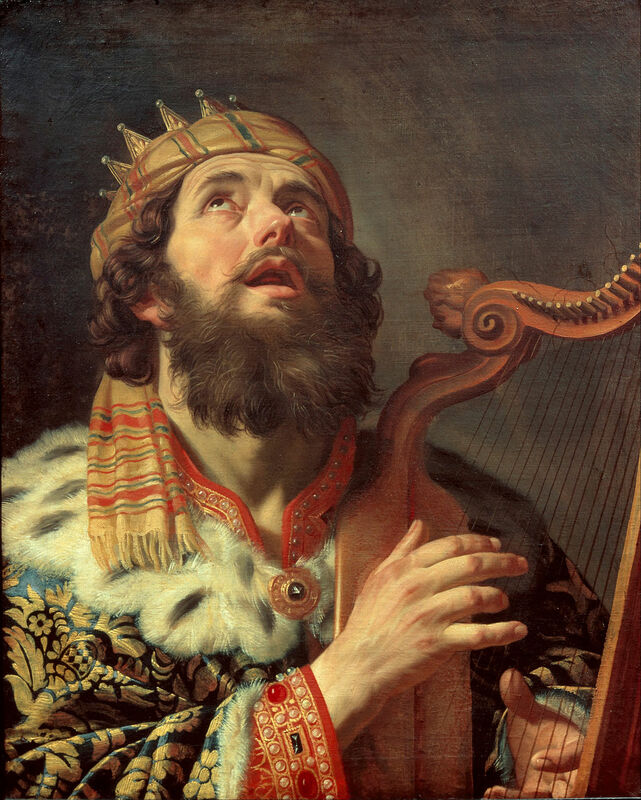 The king was becoming prideful, as Joab warns later by asking David " Why then doth my lord require this thing? why will he be a cause of trespass to Israel?" In chapter 20 of 1 Chronicles we read that David was abandoning his responsibility as king and allowing his generals to take the risks of war. Giving Satan license to tempt David into numbering the nation demonstrated just how much David saw the glory of Israel as something he accomplished, and not God. Thus the LORD shows David where his pride leads by allowing it to come to fruition in the form of a census. David was numbering his men to boast of his power, not recognizing that it is God who gives the victory. As I stated at the beginning of the letter, these passages are not contradictory, because they do not mean the same thing in the same way. The reference to God inciting David is based on His final authority in all things. God is spoken of inciting David by allowing Satan access to the king for the temptation. Satan is spoken of inciting David because he is the tempter (ref Matt. 4). God wished to restore David to a proper relationship with Him, while Satan sought his failure and demise. Taking all of the above together, we see that the purposes of God can be accomplished through the attacks of Satan. In His sovereign will, God allows His children to go through adversity to strengthen them, discipline them, or equip them for a greater task at some other time. I hope this study of these passages has helped clarify things for you. When you come across a difficult part of Scripture, such as the ones above, you should rejoice. You will usually find that unlocking such a passage will yield an important truth.